An error over a calendar means that Rathlin Island could have fewer days next year. The publication - backed by Moyle District Council together with some islanders - has been found to have a certain shortcoming. According to an island calendar for 2005, there will only be 362 days - with just 28 in March. Islander Margaret McQuilken said she would be having a party at the end of next March. "It will mean that there will be no hangover - because there will be no next day- I will have escaped a hangover." 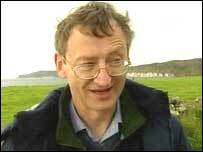 Rathlin writer in residence Iggy McGovern said he would use the time to discuss his taxes. "Clearly that would be a day that they would find it hard to find me," he joked. Islander Theresa McFaul said: "On Easter Sunday there is always a yacht race and usually a ceili that night. "On Easter Monday and Tuesday you are usually dead for those two days anyway - so really that only leaves the Wednesday and Thursday and it's hard to know what people will get up to." However, Rathlin is not unique. A book, The History of the Calendar, records that during calendar reform in 1582, 10 days had to be shaved off October. Peasants across Europe were so upset about losing what they thought were 10 days off their lives that there were widespread riots. But, Iggy McGovern said he did not believe residents on Rathlin would resort to that measure. "They would see it as a bonus," he said. "As long as everybody gets paid for the three days, I think everybody is going to be quite happy." About 50 of the calendars were sold before fault was discovered. The publication was withdrawn from sale and the faulty calendars were pulped. It has now been corrected and reprinted.